Rapid Fire: What’s on the Side of Your Home? It started with a cigarette. A child nearby first saw the fire when his skateboard rolled into the grass behind the house, according to the county’s investigation. According to that report, the child ran next door to tell neighbors, who called 911 as another neighbor started shooting video of the fire on a cellphone. That video shows gray smoke and large flames pouring out of the house before fire crews could even arrive, about 10 minutes after the initial 911 call, Brower said. Firefighter radio communications later released give insight on what four firefighters faced when they went inside. “Visibility is zero,” one reported via radio just seconds before the smoke pouring out of the house turned black. At that moment, the second-story “flashed-over,” covering every surface with flame and trapping the four men inside, Brower said. “Mayday! Mayday! Mayday!” a firefighter yelled while someone outside ordered, "Evacuate the building immediately. Evacuate!" Chief Brower said his firefighters survived by jumping out of a second-story window, sustaining bad burns. One still cannot work eight years later, the chief said. The subsequent investigation found the fire crews responding to Meadowbrook Court did many things right but did not do a full walk around the home, meaning they didn’t realize the fire had already moved inside the home. Brower said the lesson he learned that day is how the combination of vinyl siding, which covered large sections of the house, and modern day insulation can create a fire that moves so quickly, a home could be fully engulfed and collapsing down on a family before his crews can even get there. “Once they get going, they take off,” Chief Brower said. “We've seen them flash-over, full involvement, in less than 10 minutes." Stever Kerber, the director of the Firefighter Safety Research Institute at Underwriters Laboratories, conducted a two-year, million-dollar study of how quickly fire can spread up different types of siding after fire chiefs from all over the nation reported they too were battling fast-moving external fires. Kerber said he measured how long it could take a small outdoor fire, like a flame from a grill or an unattended cigarette, to turn into a dangerous attic fire. "Typically, there are no smoke alarms or sprinklers in the attic space,” Kerber explained. “So you can have a fire developing over top of your ceiling and not realize it's there until the ceiling drops down." Kerber said brick and stone don’t catch fire. “You could put a fire on brick or stone all day long and you’re not going to burn a house down through brick,” he explained. Stucco is almost as fire-resistant he added. The UL study found a fire next to vinyl siding with spray foam insulation behind it, however, could reach into the attic in less than 11 minutes. The vinyl “starts to melt, exposing what’s behind it,” Kerber explained. But the combination of vinyl siding and ½-inch polystyrene foam board became a fully engulfed attic fire in the UL study in just one minute and 51 seconds. That’s faster than most people can call 911, according to Chief Brower and Kerber. Vinyl Siding Institute President Kate Offringa told the I-Team vinyl is a safe product. “Vinyl siding does not contribute to the rapid spread of fires," she said. Offringa said her industry group is part of a “working group” of firefighters trying to increase fire safety and stated less than four percent of fires start outside the home. “At least six trade associations, including the National Association of Homebuilders, have expressed concerns to UL about the methodology,” Offringa said. “Some bad science, some unrealistic conditions that are in the study." 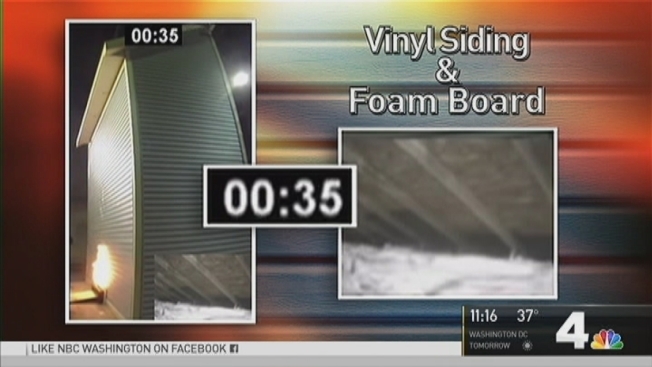 When the I-Team's Tisha Thompson asked, “What about this idea, though, that vinyl siding melts. Is that true?" Offringa responded, “It does melt at certain temperatures. It will actually melt and fall away even before it will ignite." Bowers continued, “The UL report is a self-proclaimed research project representing non-standardized test methodologies to help firefighters understand the fire dynamics in these unique scenarios.” She provided the I-Team with its own review of the UL study. But Bowers said her group would “welcome the opportunity to work with UL to identify appropriate test protocols for foam plastics insulation." UL actually develops many of the safety tests building materials must pass before they’re allowed to be installed inside your home. Kerber said UL stands by its study, hoping it will help firefighters develop new techniques to battle these blazes, because, he explained, “What they're arriving to today is very different than what it was in the past." Reported by Tisha Thompson, produced by Rick Yarborough, and shot and edited by Steve Jones and Jeff Piper.